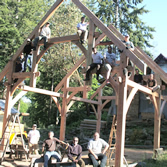 Constructing a home from raw logs harvested on site is empowering both financially and psychologically, it can also be Laborious and devastating if it fails. At ISBA we make it doable. Moving from round logs to square timbers opens up a plethora of joinery and design options, including combining the two forms using modular components. 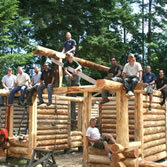 Learn skills for the growing timber industry. 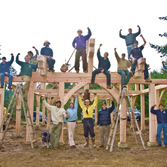 This course is for control freaks, perfectionists and those wanting to construct a Hammer Bent truss with utmost precision even with distorted and poorly milled timbers. Block and stone come together here with fireplaces, walls and pillars to create skills that will add imagination and beauty to all of your projects. Join instructor Rob Borelli as he leads students through the process of making countertops that are both functional and creative. 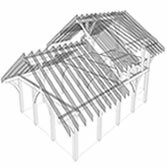 Trimble SketchUp is a powerful tool that provides a platform for creative design of Timber Frame projects. 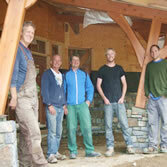 Combined with the practical skills from other ISBA courses, it takes students confidently from concept to completion. 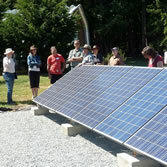 Residential solar is affordable, cuts energy costs and lowers our carbon footprint. 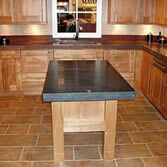 Get on board the clean revolution - it's easier than you might think.